Soil Soaker™ GRANULAR is your eco friendly soil wetter for those soils and potting mediums that get hydrophobic in dry conditions. PRO STRENGTH GRANULAR WETTING AGENT FOR DRY SOILS & POTTING MEDIUMS - Infused Silica RICH Diatomaceous Earth. Hydrophobic soils and potting mediums can create havoc for the grower or gardener when irrigation water is repelled from the area they are trying to hydrate, or the water moves straight through the soil profile and is lost to run off.Water repellent soils are formed from the decomposition of hydrophobic (or water repelling) waxy materials originating from plant residues that can coat soil particles preventing the infiltration of water into the soil profile. Soils with a small surface area (e.g. sand) are more prone to water repellence, as it takes less hydrophobic material to coat individual particles, compared to silt or clay. Potting mediums also suffer from this phenomenon as most contain a large percentage of incompletely composted organic matter.Many plants, natives and even soil fungi can contribute to hydrophobic soils and is most prevalent in sandy soils. A common way to improve soils & mediums is to apply a surfactant that will reduce the surface tension of the water, helping to penetrate the soil and to disperse the water evenly through the soil or medium. 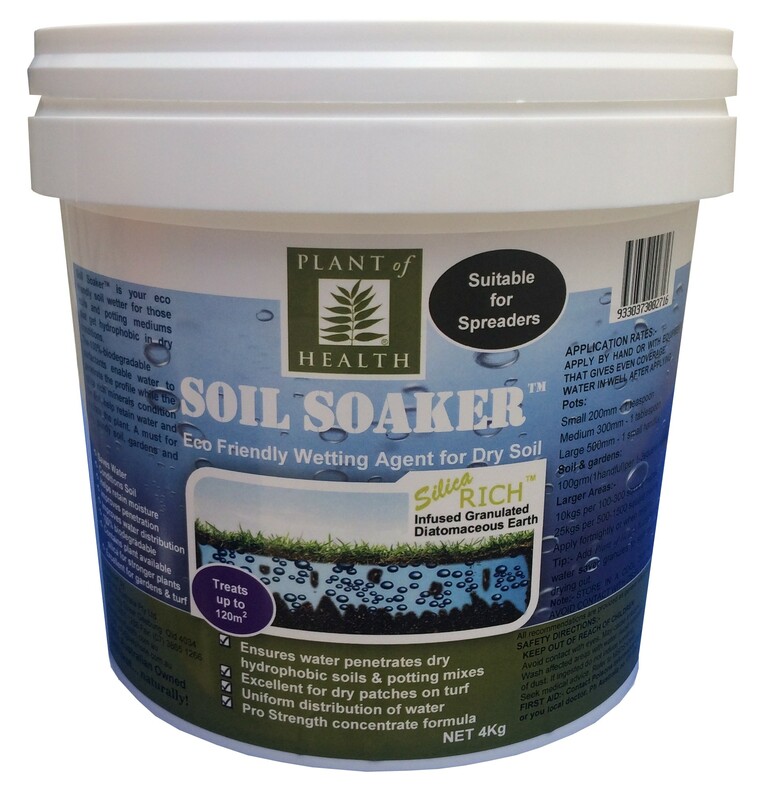 Soil Soaker™ GRANULAR is your eco friendly soil wetter for those soils and potting mediums that get hydrophobic in dry conditions. The 100% biodegradable surfactants are infused into natural diatomaceous earth granules giving you the benefit of both a surfactant and a silica rich input, that helps retain water, hydrate the plant and helps reduce plant heat stress. A must for dry, sandy soil, gardens and turf. -- Easy, convenient application. Easy spread infused Diatomaceous Earth granules. -- Ideal for pots and garden beds. -- Ideal for turf farms, golf courses, bowling greens, parks, commercial and domestic. -- Will not burn & granules readily break down for easy soil penetration. APPLY BY HAND OR WITH EQUIPMENT THAT GIVES EVEN COVERAGE. WATER IN WELL. pH>7 Trial on acid loving plants first. All recommendations are provided as general advice only. KEEP OUT OF REACH OF CHILDRENAvoid contact with eyes. Contains organic, inorganic and microbial inputs Avoid breathing dust and wash hands after use. Wear safety equipment as required. Note: Analysis may vary slightly due to natural inputs.